Commission Chamber, 1660 Ringling Blvd. The Gulf Gate Community Association unanimously passed a resolution on March 26, 2018 against the intensity and disregard for traffic and impact on the surrounding communities. This 24-acre project at the corner of Stickney Point Road and Route 41 proposes to build 140,000 sq. ft. of retail space, 414 residential units and a 130-room hotel in the form of 13 different buildings ranging in height from 35 to 80 feet. This would be nearly double the allowed unit density under the current zoning. 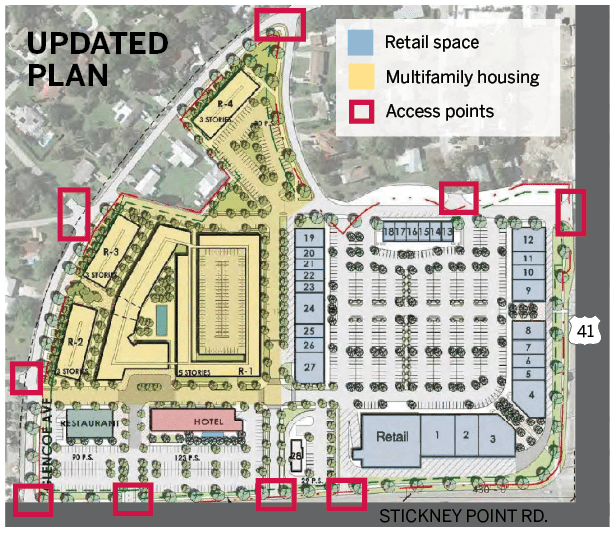 In addition to the density issue, concern has been raised about traffic impact to the key evacuation intersection of Stickney Point and 41, as well as the potential to increase traffic in the Pine Shores neighborhood, on Constitution Avenue and Gulf Gate Drive and surrounds, as drivers seek to avoid the intersection at peak times. Currently this intersection is routinely blocked during tourist season, and access to Siesta Key is substantially delayed. Consider signing this petition opposing the project.